WAGO Terminal Blocks have a long standing reputation for reliable, safe and maintenance free system operation in a wide variety of industrial applications. 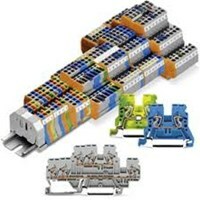 WAGO Terminal Blocks feature a wide and flexible product line. In addition to the single-deck terminal blocks, double and triple-deck and function blocks are available for a variety of applications. Including fuse, disconnect, test, electric motor wiring, diode, LED terminal blocks and pluggable terminal blocks. ECD has a large inventory of automation and control products in stock and ready to ship including WAGO TopJob series terminal blocks. Call ECD today for all your WAGO terminal block needs.